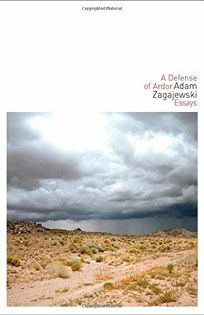 The 14 essays that make up poet Zagajewski's ""defense"" are an engagingly warm and witty blend of literary comment and memoir, passionate about aesthetic matters but refreshingly free of personal rancor. Zagajewski was born in Poland at the end of WWII; his career is inexorably bound up with the fate of his homeland, and his essays are full of the critical but fierce patriotism common to the country often wryly called ""God's playground."" Zagajewski's combination of the personal, literary and political is canny and well judged, as in the excellent ""Nietzsche in Krakow,"" which begins as partly nostalgic reminiscence, tracing the author's furtive discovery, as an adolescent living under communism, of the officially proscribed ""mustachioed philosopher"" and his delight in ""the scorn with which this philologist and philosopher treated the state."" But this remembrance of youthful enthusiasm underlies a more skeptical view, in which Nietzsche's disdain for objective truth and worship of irrationality are seen to underlie not only fascism but, through Lenin, the state socialism of postwar Poland. Though the essays are written in a casually intimate style, such names as Mann and Musil are invoked without undue strain. In other essays, the careers of such friends and luminaries as Czeslaw Milosz and Zbigniew Herbert are contextualized with both intelligence and affection, as are cities in which Zagajewski has lived, written and taught.